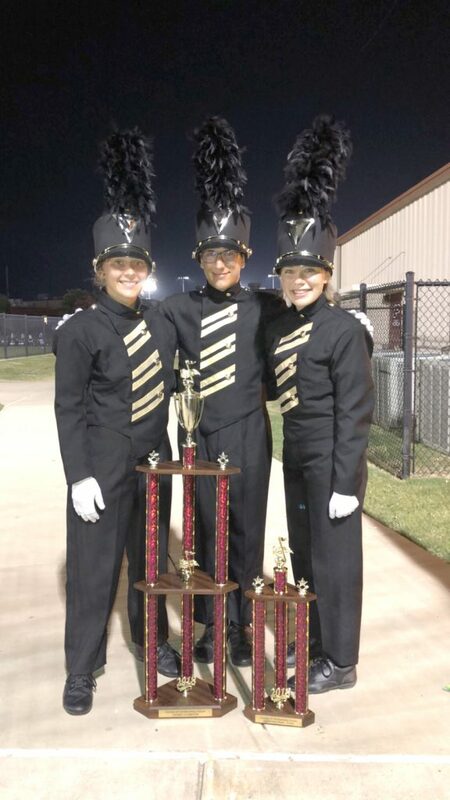 North Lamar High School Drum Majors Allison Bright, Stoney Shelton, and Jacey Lilley stand with the Class 4A Champion and Grand Champion trophies the band won at the Sounds of Fall Marching Contest while competing against Class 4A-6A bands. The North Lamar High School Band began its competitive marching season on Saturday, October 6 with an incredible start at the Sounds of Fall Marching Contest held at Princeton High School. The Panthers’ show entitled “Unidentified” left the audience identifying who the best band was at the contest. After their preliminary performance, North Lamar’s band won Outstanding Music and Marching captions, and the Marching Band was awarded Class 4A Champion. North Lamar was then selected along with ten other class 4A-6A bands to compete for the title of Grand Champion in the finals that night. North Lamar outshined all the other bands and was awarded Grand Champion for the entire contest. They were also recognized for having the highest music scores of all the bands competing. North Lamar will be competing again on Saturday, October 13 at Royce City at 2:45 pm and on October 16 in Mt Pleasant at 3:30 pm.